There has been a lot going on lately: I think openEHR has made serious committments to step up the game and it looks we will have a much more active Foundation very soon. Firstly check out the new membership options. It is really good to see good industry support and engagement. It is the season of elections really – had it in NZ last week, next week in Brazil (I know because there is a lot hinging on it as my colleagues say! ), and openEHR will have its first democratic elected Board soon 🙂 One needs to be a formal member (takes 15 Euros) to be able to vote (a new members website coming soon). For me the highlight was the openEHR Roadmap Meeting in Oslo (16-17 Sep, 2014) which I was able to participate online but there were close to 40 who attended phsyically. Here’s the summary meeting report. Bottomline is substantial modelling activity, lots of outstanding tasks and new tooling work will commence – thanks to the financial and in-kind support from the industry partners. As I could see the importance of FHIR and its impact on pretty much every aspect of health IT has been acknowledged by the openEHR community. I enjoyed the constructive criticism and willingness to contribute – almost everyone is aware that the majority of vendors will never adopt openEHR ‘in vivo’ – which means as their internal means to represent health information so aligning openEHR clinical models with FHIR methodology will be critical. There was a session on this very topic during the meeting – check out the meeting notes. I was really impressed by the analytical capabilities demostrated by vendors and the proposal to include the Guideline Definition Language (GDL) as part of openEHR specs as presented by Rong. I fully support it – that’d form the uppermost level of the openEHR spec stack and will be key to demonstrating tangible ‘value’ in terms of improving care. Here’s the diagram that got me really excited during Rong’s presentation – from Alan Rector et al. paper. This is by far the best illustration of how terminology/ontology, clinical models (Archetypes & Templates) and the dynamic decision bit (e.g. guidelines, rules engine etc.) come together to make a decent Clinical Decision Support System. Alan Rector et al.’s very clear diagram of CDSS components. Atalag K, Yang HY, Tempero E, Warren JR. Evaluation of software maintainability with openEHR – a comparison of architectures. 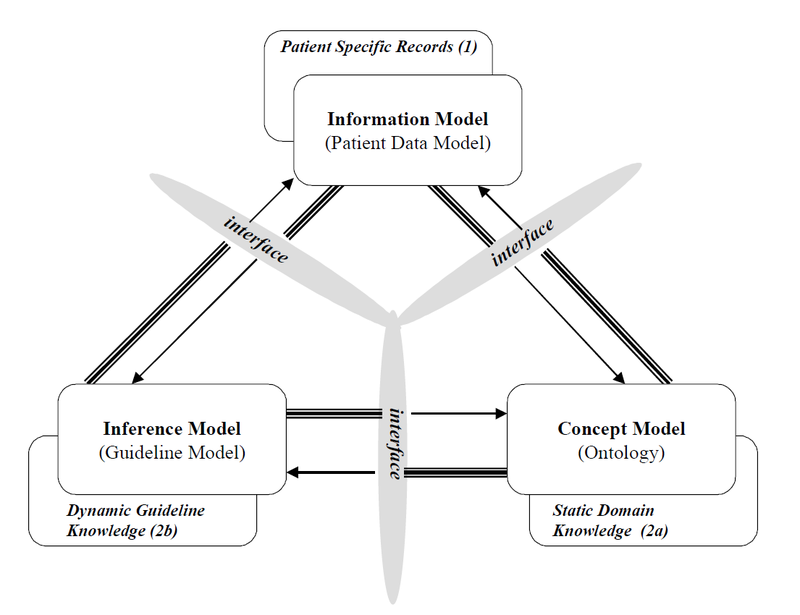 International Journal of Medical Informatics. 2014 Nov;83(11):849–59. This entry was posted in global stuff, other standards. Bookmark the permalink.